I am a member of the most fantastic CSA. Every week I get a box delivered right to my door and every week I am delighted. While I pride myself on having cultivated an almost encyclopedic knowledge of foodstuffs, they often include something in the box that was off my radar. There is typically a mix of veg, fruit, dairy, animal protein, fresh bread, and one or two pantry items. And it comes with recipes too! The CSA is called Quinciple, and it’s the best. One week in early June I opened the box to discover this: The ingredient information included in my CSA box said that it was angelica and that had been foraged. I am not going to lie. Not only had I never seen angelica before, I’d never heard of it. So, I hopped on the interweb and did a bit of digging. What I turned up was so intriguing I could hardly contain my excitement. Apparently, angelica is pure magic. According to Dan Riegler, at the New Dawn Herbal Apothecary, “Angelica is considered carminative, stimulating, a diaphoretic, stomachic, tonic, and expectorant.” Historically it has been used in myriad ways: to aid digestion, to ease chest congestion, for heart health and as a birthing herb (to help expel the placenta). I could go on. I was excited about the angelica for a number of reasons. To begin with, you can use the whole kit and caboodle: roots, stems, berries, leaves and seeds. Pretty cool. Also, it’s one of the herbs in Chartreuse, and often in vermouth and gin– all of which I imbibe regularly. And lastly, the research I dug up described the flavor of angelica as akin to the love child of celery, anise and juniper. . The recipe that follows is what I should have done. It’s fairly straightforward, but it requires a LOT of time. At the end of this post, I’ve added in what I actually did, which was a small disaster. Sigh. Hindsight= 20/20. note: all of the recipes I turned up agreed that the angelica stalks should be 2 yrs old and harvested in mid-late may when they are tender and not yet purple. Guess what? I have no idea how old my angelica is, and I received it in early June when it was a little purple. I forged ahead anyway, and was happy with the results. note 2: baking soda will help the stems retain their green color. In fact, it will accentuate it. My stems turned a brilliant emerald color (even the slightly purple parts). 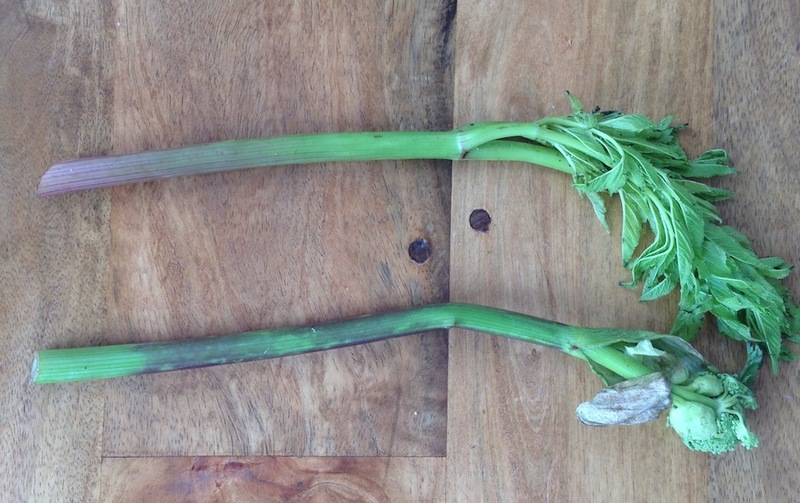 1.Cut angelica stems into 4″ long pieces (it is easier to peel them if they are long). 2.Cover angelica in one cup water and baking soda. Boil 5 minutes. 3.Plunge angelica in ice bath. 4.Peel– when fully chilled, scrape off outer layer of stalk with a knife. 5.Boil-1 cup sugar and 1 cup water for 5 minutes. Put angelica in a container, pour sugar syrup on top and let sit overnight in fridge. 6.Cook angelica in sugar syrup for 5 minutes. Return angelica and syrup to fridge to sit overnight. yes! it’s really this green. 7.Cook angelica once a day, for 4 days in sugar syrup for 5 minutes. Each time return to fridge and let sit overnight in between cooking. After 4 days angelica should be translucent and won’t lose its shape. 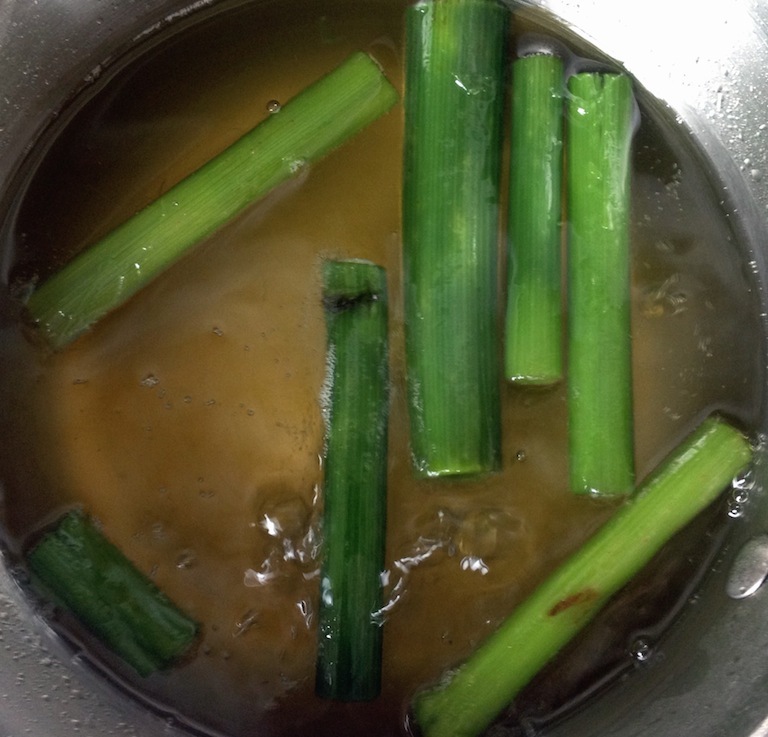 8.Remove angelica from syrup, drain and roll in sugar. Transfer to a wire wrack and let dry on counter overnight. 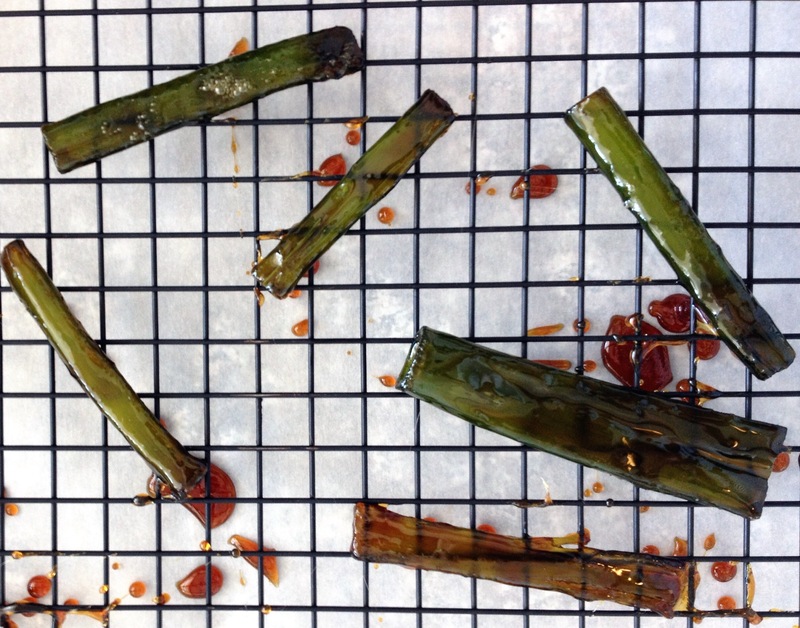 9.Cut angelica into smaller pieces (if desired) and re roll in sugar. Store in air tight container up to two years. *Disaster explained- While I do candy citrus peels from time to time (citron and grapefruit are some of my faves), I don’t do any actual “candying”, as in pulling sugar or making taffy or anything that requires me to distinguish between “soft ball” and “hard crack” stages of sugar temperatures. I stay far, far away from that sort of thing. It’s messy and intimidating and I’m just not good at it. 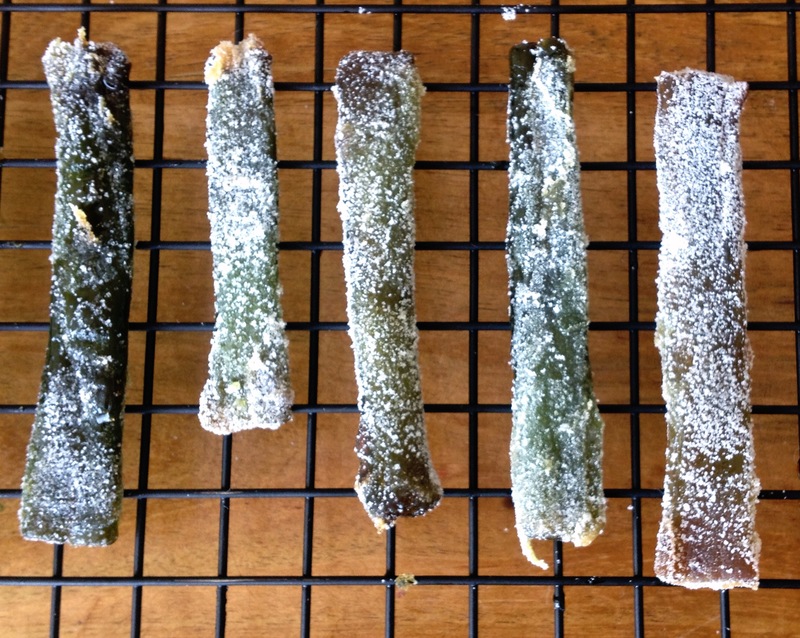 I looked through a number of candied angelica recipes and found that no two were alike. Some called for a 2 day soak before cooking the angelica, some called for 2 days resting time between cooking, some said to cook the angelica 2 times, some said 4 times, etc. I settled upon a recipe that I thought seemed thorough. The last step of that recipe called for bringing the sugar syrup to 140 degrees celsius. And that is where the problem started. If I had done my due diligence and converted celsius to fahrenheit before I started, I never would have selected this recipe. 140 degrees celsius is 284 fahrenheit- smack in the middle of the soft crack range of candy making. If you don’t know what that means, allow me to translate: soft crack= G.D. mess all over your kitchen. There is no need to bring the sugar to that temperature. A simple boil for 5 minutes will do the trick. The angelica pictured below is nice and translucent, which is what you are trying to achieve. The problem is the sticky brown candy mess. The process: This takes a week to make. That’s a long time. Even if you avoid my mistakes, it’s still a labor of love. The verdict: Well, what can I say, I do love a project. And this certainly delivers. It’s a pain in the bum. Is it worth it? For me, yes! That said, you can buy some candied angelica here for the bargain price of $6.98.